Grease fittings come in many different styles. There are two grease fittings that are very common. These are the 1/4″-28 thread and the 1/8″ NPT thread. However, there are other less common grease fitting threads in use. Here are some ways to identify the threads on your grease fittings. The easiest way to identify the thread on a grease fitting is to use a tool made specifically for this purpose. Grease fitting thread gauges are available from industrial equipment suppliers for around $50. Although convenient, you can identify your grease fitting thread without spending the money on this specialty tool. It’s easy to determine which grease fitting thread you have by taking three separate measurements and finding your thread on the chart below. Measurement #1 – Straight or Tapered? The first step in determining a grease fitting’s thread is to determine if the thread is straight or tapered. This is done by a visual check. Look carefully, a tapered thread is only tapered by about 3 degrees and is easy to miss if you aren’t careful. The number of threads per inch is known as the thread pitch. 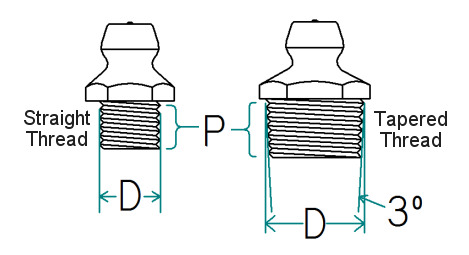 The best way to determine thread pitch of a grease fitting is to compare the threads to something with a known thread. 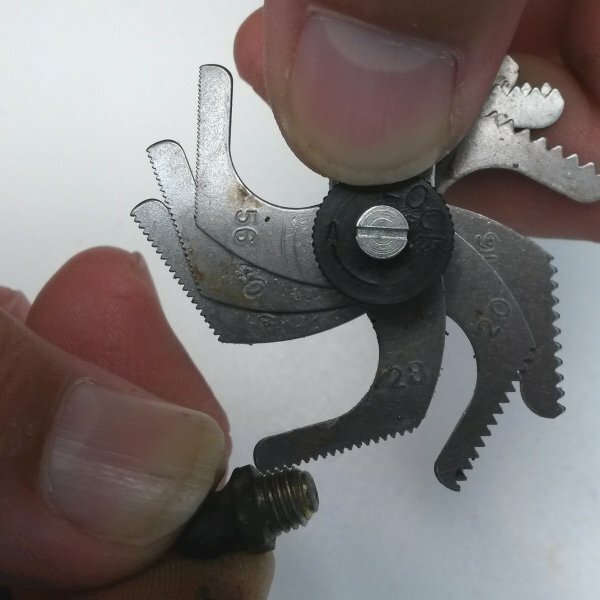 A thread pitch gauge is the ideal tool for this but you can also compare the grease fitting threads to a known bolt thread, pipe thread, or another grease fitting. Place the known thread against the unknown thread. If the two threads engage, the thread is the same. If they do not, the thread is different. The last measurement you need is the outer or major diameter of the thread. A set of calipers makes this an easy measurement to take. 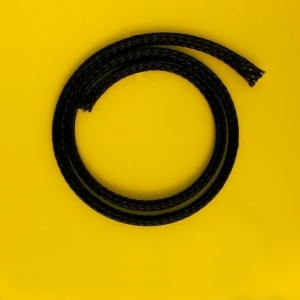 Dozens of different variations exist in grease fitting threads. We carry the necessary fittings and adapters to fit nearly every grease fitting port thread. These fittings cover more than 98% of the bearings found in the US. 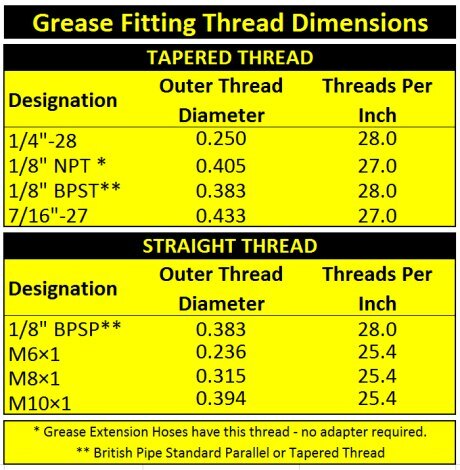 See the chart below to identify your grease fitting thread.